It means that I am asking the Divine to protect me from evilness and everything that is preventing me from entering that Divine Presence. When we say, “A’udhu billa…” we are asking to seek refuge in Allah, our Creator. But the Creator is not the police. If your car breaks down on the side of the road you may pray to God for help, and God is the one inspiring the police to come rescue you, but you wouldn’t say that God Himself is going to come down on His throne and appear before you. That is a superficial, material understanding of the Creator.. That is why Sufism comes to raise our spiritual understanding and to introduce Heavenly secrets onto our soul, like throwing seeds upon fertile soil. We may not understand their purpose or their meaning, but in time these seeds will blossom and we will eat from those fruits. O you who believe, Believe! It is a tremendous blessing, and we pray that one day we will be granted a full comprehension of just what these masters have given to us as their students. We are students in a very prestigious spiritual university known as Naqshbandiatil ’aliya, the Most Exalted Naqshbandi Order. If we are finding ourselves to be present here, it is because our Creator wants us to learn from His ‘arifeen, from His Gnostics. Through their spiritual connections, the ’arifeen (gnostics) have been granted Heavenly knowledge that people have not heard or read before, because it is not knowledge from books. It is the way of the heart, and if the heart is open its capacity for such knowledge is infinite. 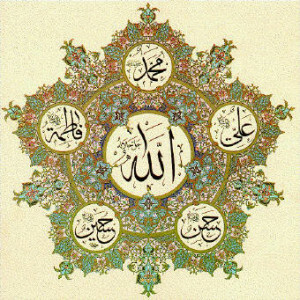 From their spiritual connection with the Divine Presence, these saints understood that the only way to enter into that Heavenly Kingdom is through the love of Sayyidina Muhammad (s). Today, many people are asking, “Who is Sayyidina Muhammad (s)?” And the reply comes that the reality of Sayyidina Muhammad (s), and the honor and majesty which has been dressed upon Sayyidina Muhammad (s), is something indescribable. 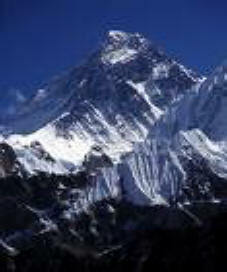 He is the one who was granted to intercede for all creation. The one who traveled beyond the seven Heavens, beyond where any angel has ever traveled, to a station of “two bow-lengths or nearer” فَكَانَ قَابَ قَوْسَيْنِ أَوْ أَدْنَىٰ ٩ (Quran 53:9) to the Divine Presence. He is the one who was created for the purpose of revealing the Holy Qur’an – God’s ancient, uncreated speech, which contains every knowledge of every creation from the beginning of time until the end of time, and which emanates from God’s Ocean of Power, known as Bahr ul Qudra بحر القدرة. It means that the Holy Qur’an is the source of power for all of creation; a power which nothing could contain except the heart of Sayyidina Muhammad (s). “Had We sent down this Qur’an on a mountain, verily, thou wouldst have seen it humble itself and cleave asunder.” (Al Hashr (the Exile) 59:21). 68:4 “Truly, thou (O Muhammad!) are of a sublime nature” (Al Qalam (the Pen) 68:4). Prophet (s) never said anything from his own will.It means that he has no will of his own, no ego. He is the example of perfect submission to Divine Will, and it was something so special that Sayyidina Isa (as), Jesus Christ, said to his disciples, “there is someone coming after me who will not speak from his own desires, but will only speak what his Lord commands him to speak.” Therefore, when you are seeking to approach the Creator, there is a protocol involved that saints want us to understand. Everyone is seeking to approach God, but who can approach that power? We cannot approach; we would be fried. The only one who was granted that ability was Prophet (s). Therefore, you can only approach that Divine Presence through light of Prophetic Reality. If you are dressed from the Muhammadan Reality, you will be granted access, but if not there is no access. That is why we say La illaha ill Allah Muhammadun RasulAllah. We say it, but do we know what it means? Divine is saying, “you can only approach Me, you can only approach the ocean of La illaha ill Allah through Muhammadun RasulAllah.” He even honored Prophet (s) by connecting His Divine name Allah with Rasul, Prophet’s (s) name – RasulAllah. 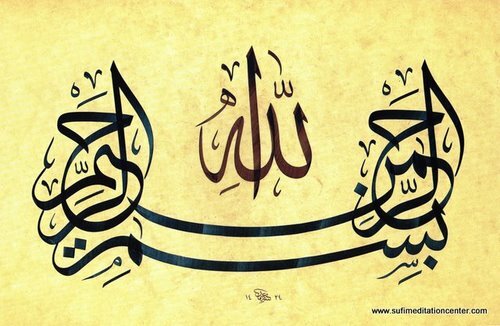 It means that the only way to Allah is through the Rasul of Allah. 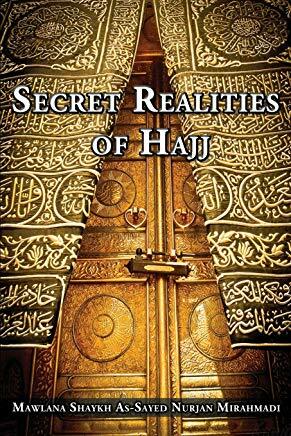 When we understand that reality of Prophet (s), it begins to open many secrets. When we ask for protection from evilness, Mawlana Shaykh is now teaching us to clarify our intention. Who are you asking to provide that protection? When you are asking for Allah’s protection from evilness you say, A’udhu bi’llahi minash shaytani’r rajim, Bismillahi’r Rahmani’r Raheem. (Al Nisa (The Women) 4:59). Don’t think Allah’s hand is coming like a security guard to protect you. Who is His lawmaker and lawgiver? Who is his khalifa (representative)? Sayyidina Muhammad al Mustafa (s), the conveyer of Holy Qur’an. When the Divine speaks, He does not speak to creation or the angels, He says to Sayyidina Muhammad (s) “Qul, Ya Muhammad!”, and Sayyidina Muhammad (s) speaks on behalf of the Divine to all of creation. No prophet and no angel has even seen God. There is no one who has ever seen God except Sayyidina Muhammad (s). Therefore, the reality of Prophet (s) is beyond our understanding. He is God’s Beloved. He is God’s representative to creation, and because of that honor the saints focus their love on Prophet (s) and constantly send blessings and salutations on him. “Undoubtedly, Allah and His Angels send blessings on the Prophet. O you who believe ! Send upon him blessings and salute him fully well in abundance.“ (Al Ahzab (The Combined Forces) 33:56). “Enter houses through the proper doors” (Al Baqara (The Cow) 2:189). My Companion are like Stars Prophet [s] describing. The Enlighten One as Stars of the Heavens. From that inheritance, and from Mawlana’s teachings, is the reality of the 12 months, which are 12 veils or spiritual emanations that are dressing creation throughout the year, and which are being dressed by the 12 Imams. Also from that inheritance, the secrets of Bismillah ar Rahman ar Raheemare flowing through Prophet’s (s) Ahlul Bayt. All of the power of Holy Qur’an is contained in 30 juz, and those 30 juz are condensed like a laser into the 7 verses of Surat al Fatiha, and the power of Surat al Fatiha is condensed into the 19 letters of Bismillahir Rahmanir Raheem. The number 19 is a Secret number, composed of the numbers 1, representing the beginning, and number 9, representing completion. 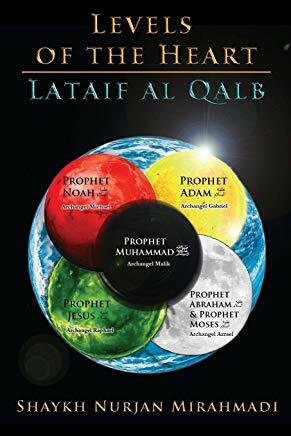 Put together they represent the reality that all knowledge from the beginning until the end is contained within Bismillah ar Rahman ar Raheem. “and the complete knowledge of the Holy Qur’an is contained in the Fatiha (first chapter of Quran). 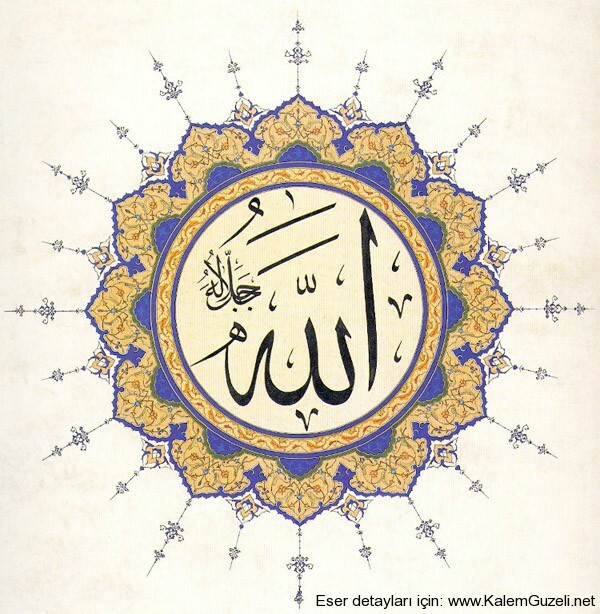 And all the knowledge in Fatiha is contained within the Bismillah (Bismillah ar Rahman ar Raheem). And all the knowledge in the Bismillah is contained in the letter ‘ba’ ب (harful ba ب). Then Bismillah ar Rahman ar Raheem can be broken down even further into the Arabic letter “Ba” ب. 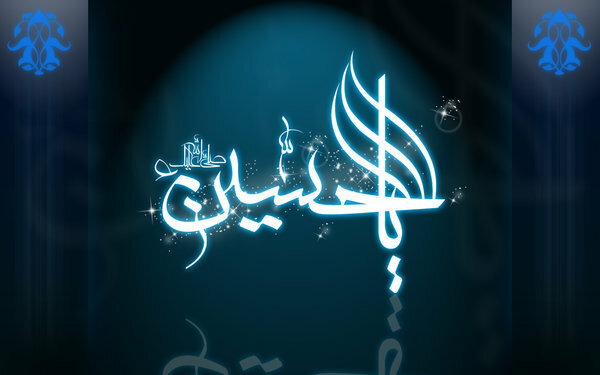 Then below the Ba ب is the nuqt, or the dot of the “Ba”ب, which is a Secret from the reality of Sayyidina Ali (as). 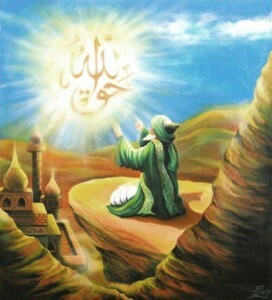 Ali علي is composed of Ayn ع, Lam ل, and Ya ي. The Ayn ع / Eye is for al ‘Aleem العليم, Allah’s ancient knowledge which is dressing Sayyidina Ali (as). Lam ل – is for the inheritance of the Lisan al Haqq لسان الحق, Mulk/dominion of Knowledge. Holy Quran 19:50 Wa wahabna lahum min rahmatin awaja alna lahum lisana sidqin Aaliyya And We bestowed of Our Mercy on them, and We granted them lofty honour on the tongue of truth. 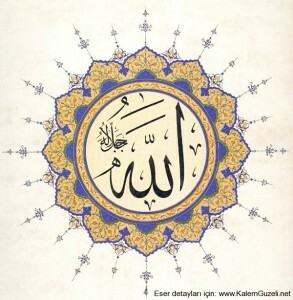 Ya ي is Yaqeen يقين and Certainty of that Knowledge and Vision Ayn of certainty عين اليقين . He is the Door to this Heavenly City of Knowledge /Sayidena Muhammad [s] means that all of the knowledges of Holy Qur’an are flowing through Sayyidina Ali (as), through the “Ba”ب. The Ba ب is also for Bahr ul Qudra بحر القدرة (the Ocean of Power). 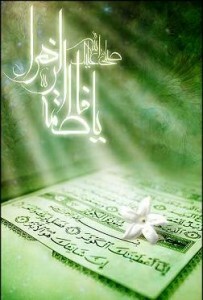 It means that all the power of Holy Qur’an can be found in the Ba ب of Bismillah ar Rahman ar Raheem. That is why Sayyidina Mahdi (as) is from the lineage of Sayyidina Ali (as). Sayyidina Mahdi (as) is only as powerful as his grandfather and his grandfather is taking from Bahr ul Qudra بحر القدرة, the Ocean of Power. Muhammad (s), Ali (as), Fatimah az Zahra (as), Hassan (as) and Hussain (as) . In other words, the Ahlul Bayt are existing within the ocean of Bismillah ar Rahman ar Raheem. From the Meem م of Bismi came the first spring of a pure, transparent crystal water. From the Ha of Allah came the second spring, which was a river of milk. From the Meem م of Rahman came the third spring, which was a river of untarnished Nectar, which elevates without abasing, and from the Meem م of Raheem came the fourth spring which was a river of pure honey. 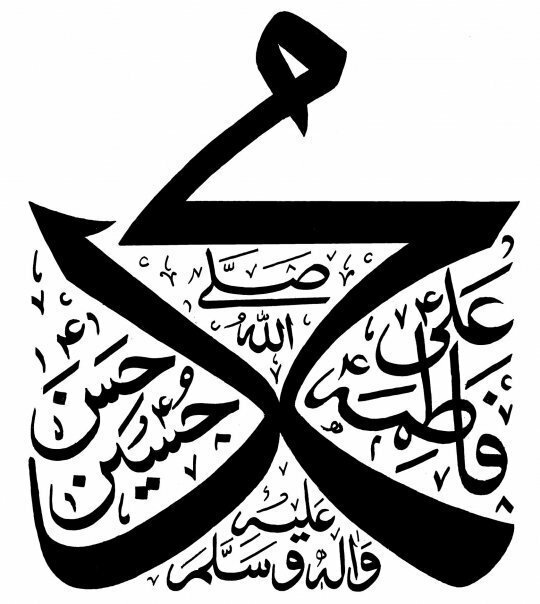 Put together, it reads Meem م, Ha, Meem م, Meem م which is “Muhamma”. 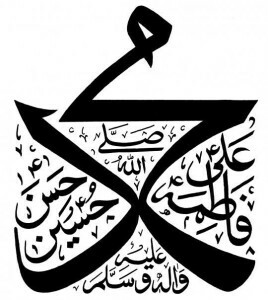 To thee (O Muhammad!) have We have granted the Kawthar (Fountain of Abundance). “The fountain of abundance” means it is the source of all realities, known and unknown. It is the spring of Heavenly knowledge, so for anyone to reach their reality, they must be drinking from the Kawthar, which is owned by Sayyidina Muhammad (s) and is flowing through his Ahlul Bayt (his family). The reality of Sayyidina ‘Ali also corresponds with the 12 lunar months that are dressing our Gnosticism, because there are 12 months and there are 12 Imams. 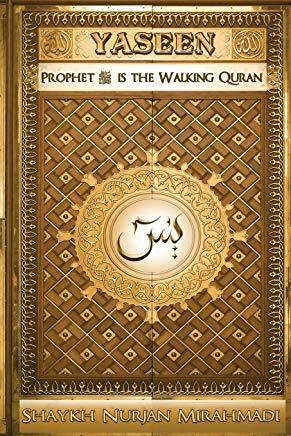 Imam Ali says, “The Prophet was once asked about the Imams while I was in his presence. He answered: I swear by the sky, [displaying] the Zodiacal signs (a reference to 85:1). Their number is the same number of the signs of the Zodiac. I swear by the Lord of the nights, days, and months their number is the same as the number of the months. The companion said: Who are they O messenger of Allah? So the Prophet (pbuh) placed his hand on my head and said: The first of them is this (Imam ‘Ali) and the last of them is Al Mahdi. Whoever supports them has supported me, who ever opposes them opposes me, whoever loves them loves me, whoever disdains them has disdained me, whoever rejects them has rejected me, and whoever acknowledges them has acknowledged me. Through them Allah protects His religion, expands His lands, sustains His people, brings down the drops of the sky, and the blessings of the earth emerge. They are my trustees and successors and the leaders and masters of the believers. As each month passes, the Imams are dressing us from their realities and moving us along in our spiritual growth. Then each month is also dressed by a Surah of the Holy Qur’an. “We have honored the children of Adam” (Al Isra (The Night Journey) 17:70). Saints have received that honor and they are moving with the power of 9, the highest single-digit number. So as we are moving through the 12 months, we are moving from 1 through 12, but they are moving from 9 to 108 (9×12=108). So Surah Tawbah is dressing the month of Muharram محرم, and on the 10th of Muharram is the Day of Ashura عاشورا and the sacrifice that Imam Hussain حسين(as) made on behalf of the nation of Sayyidina Muhammad (s). Then when we read Surah Tawbah, it has no Bismillah ar Rahman ar Raheem, and Mawlana Shaykh wants us to understand that the reason for this has to do with the sacrifices made by the family of Sayyidina Muhammad (s), because when you sacrifice something, you don’t say Bismillah ar Rahman ar Raheem. You can’t say God is Most Merciful, and then slaughter something. So instead, you say “Bismillah, Allahu Akbar!” So as Surah Tawbah is dressing the month of Muharram and Ashura, then Sayyidina ‘Ali and Sayyidina Hussain حسين(as) are teaching us the reality of sacrifice. At the most basic level, sacrificing means to give from what you have for the benefit of others, and for most people that equates to time and/or money. But to achieve what Mawlana Shaykh wants us to achieve for our soul, we must be willing to sacrifice ourselves. It means that we must be willing to turn the knife inward, and start the difficult process of cutting away all of the evilness and bad character that lies hidden within. Grandshaykh ‘Abdullah al Fa’iz ad Daghestani said that, to just come against one bad characteristic is like a battle of 700,000 to 1. Sayidina ‘Ali (as) is teaching us in the 1st month, under the 9th Surah (Surat at Tawbah), that “you must come through my door, the door of repentance. ”It means enter with repentance and then start to understand the importance and the reality of sacrifice. Ism Allah al Khaliq الخالق – In the secret of creation ALLAH is the Creator and all creation is given its secret to exist to every womb, a creation is coming with Allah’s secret dressing it. 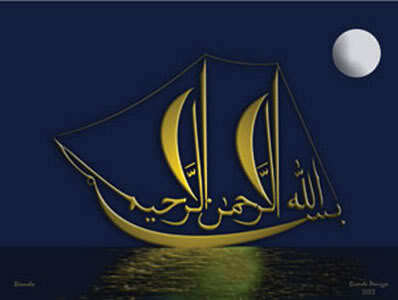 That owner of all Secrets is Sayidena Muhammad [s] this is the inheritance of His Daughter Sayidatina Fatima Zahra [as]. With the Ba ب of Sayidena Ali [as] and Secret of Al Khaliq Dressing Sayidatina Fatima Zahra [as] coming BISIM ALLAH بِسْمِ اللهِ . The birth of all the custodians of the Secret of Sayyidina Muhammad [s] First Born of Imam Hasan حسن[as] and then the birth of Imam Hussain حسين[as]. Then as we continue to break down the meanings of Bismillah ar Rahman ar Raheem, from the Rahman رَحمَن is coming Imam Hassan (as) and from the Raheem رَحِيم is coming Imam Hussain حسين(as), and their secret is being born through the womb of all creation, Saydatina Fatima az Zahra (as), who is dressed by the Secret of Divine attribute of al Khaliq, the One who Creates. Rahman رَحمَن is composed of Ra ر, Ha ح and Meem م, which creates the word “rahem رَحم”¸ which means womb. The womb is a symbol of God’s mercy because it is the source of life, and the womb of Fatima az Zahra (as) is carrying the secrets of Rahman رَحمَن and Raheem رَحِيم , which are manifesting through her children, Imam Hassan and Imam Hussain حسين(as). Noon ن or Noor Light of all creation. sub particles which are all Light and Light is Energy. Everything that is coming into existence in our material world is coming through the attribute of Rahman رحمن. When we pray for hassanat حسنات (good deeds) in this life and hassanat in the next life, what are we really asking for? 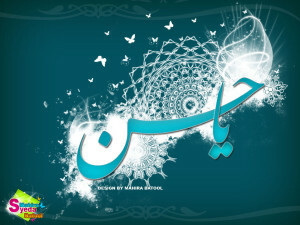 Hassanat حسنات means to be with Sayyidina Hassan (as)! If you are with Sayyidina Hassan (as) you will have achieved Divine satisfaction, and that mercy will dress your soul here and hereafter. Noon ن-for the Noor or Light of Realities. Noor Light of Al Rahman الرحمن. Imam Hassan حسن (as) is from the reality of Rahman رحمن, which is the attribute of mercy that is dressing the material world, and Imam Hussain حسين is from the reality of Raheem رَحِيم, which is dressing the world of light. Everything that is coming into existence in our material world is coming through the attribute of Rahman رحمن, through the pure light and pure goodness of Imam Hassan حسن. Sayyidina Hassan حسن (as) is also dressing the 2nd lunar month, the month of Safar صفر , which is opening the secrets of the 18th Surah, Surat al Kahf سورة الكهف (The Cave). In the 9th Surah, verse 40, the cave is first mentioned, but it doesn‘t open its full reality until the 18th Surah. Al Kahf tells the story of the Ashabul Kahf اصحاب الكهف, “the People of the Cave”, also known as the seven sleepers. They were seven young men whose people had left belief and were following evilness. They advised their people to come back to the way of spirituality, but they refused to listen. Rather than being overcome by that evilness, the seven sleepers sought refuge in the cave. Wa idhi’ tazaltumo hum wa ma ya’budoona illAllaha fawoo ilal kahfi yanshur lakum rabbukum mir rahmatihi wa yuhayyi lakum min amrikum mirfaqa. 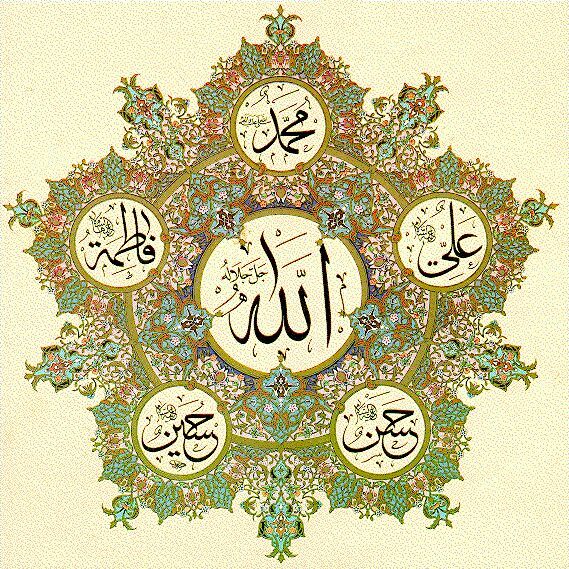 Ya ي – Yaqeen Master of Certainty by way of Sacrifice the Master of Shuhada /Witnessing. Noon ن -for the Noor or Light of Realities. Oceans of Hayat Eternity. Imam Hussain حسين he is the Imam at 27, corresponding with the 27th Surah and 3rd lunar month, Rabi ul Awwal. 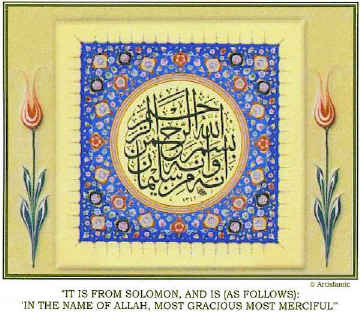 “A word of peace from a Lord of Rahim (Most Merciful)” (Ya Seen, 36:58). Divine is showing you that if want real peace, the peace of spirituality that is an eternal gift on the soul, then you must follow the way of Sayyidina Hussain حسين (as). It means you must sacrifice. These are the Owners of Kawthar. 72 has to do with the martyrdom of Imam Hussain حسين (as). The story of Imam Hussain حسين (as) is one of unimaginable sacrifice, and it shows the greatness of Sayyidina Muhammad (s).Where Prophet Abraham (as) was asked to sacrifice one boy and he struggled; Prophet (s) was asked to sacrifice73 of his grandchildren and companions and he never said anything. He knew who was going to kill them and he didn’t make a single prayer asking for that destiny to be changed. There are many historical narrations that Prophet (s) kissed Sayyidina Hassan حسن (as) on his lips and Sayyidina Hussain حسين (as) on his neck; showing his companions that he knew that one would be poisoned and the other would be killed. Imam Hussain حسين (as) also had foreknowledge of future events because he is inheriting from the heart o f Sayyidina Muhammad (s). He knew what was going to happen at Karbala. If you think he didn’t know, then you have already diminished his station. Therefore, there is no need for division over those events. He knew what was going to take place and he wanted that station to intercede for creation on the Day of Judgement. The people of Kufa came to Sayyidina Hussain حسين (as) and asked for his help. They were people who had been deceptive in the past. Those close to Imam Hussain حسين (as) warned him not to go, but Imam Hussain حسين (as) stood for truth and justice. If someone asked for his help, he never turned them away. 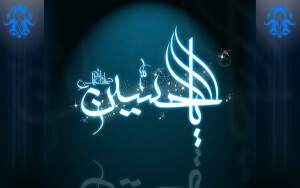 So against all advices, he took his family and several companions and proceeded to Kufa, but his companions were right. they slaughtered 72 members of the family of Imam Hussain حسين (as), 73 including himself. Young boys who could barely lift a sword jumped to defend him and were immediately killed. With no access to water in the blistering heat of the desert, Imam Hussain حسين (as) desperately appealed for water to quench the thirst of his infant son, but instead they shot an arrow into the baby’s neck, killing him and soaking Imam Hussain حسين in the blood of his own child. When you sacrifice an animal, it is a matter of Divine law that you provide it with water because as the blood drains the sensation of thirst is overwhelming. But their hearts were so hard that they didn’t even grant the family of Imam Hussain حسين (as) this small mercy. He pleaded with them to return to their senses, asking them how they could recite la illaha ill Allah, Muhammadun RasulAllah, how they could accept the Messenger and then turn around and slaughter Messenger‘s family? But from the knowledge of saints, they are teaching us, don‘t under estimate the station of Imam Hussain حسين . Prophet (s) said that his nation would be split into 73 groups. 72 groups would be on the wrong way, and 1 group would be the correct way. Sayyidina Hussain حسين (as) knew this reality, and his desire was to intercede for those 72 on the Day of Judgement. 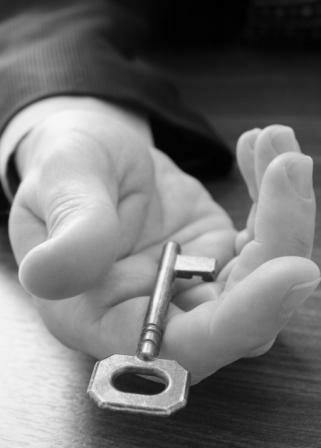 He’s saying, “the key that unlocks the door of intercession for these 72 groups was forged with my life. From this reality, saints are teaching us “don’t curse anyone!” You must love Prophet (s), you must love his government, you must love his family and all of creation. Imam Hussain حسين (as) is saying, “Don’t say death took me by surprise! Don’t curse the people who did it! Why are you cursing them? So that I couldn’t be Shahid?? So we wouldn’t have that key? I sacrificed myself for you!” These were huge saints with incredible power. They didn‘t grant water to Imam Hussain حسين , thinking that they could somehow deny a saint and an inheritor of the blood and light of Sayyidina Muhammad (s). Impossible! How Imam Hussain حسين (as) is inheriting from the Kawthar in Paradise, but he can‘t make a prayer to God for water? He didn’t because he is showing his station. That level of character is unimaginable, and that is why it is important to remember the life of Imam Hussain حسين (as) and follow his example. He is carrying the greatest of sacrifices not because he wants us to copy him, but because he can‘t tell someone to do something that he didn‘t do. They are able to teach us about sacrifice because they sacrificed more than anyone in creation. When we struggle against a bad desire we can look to their story and realize that our struggles and difficulties in life are so small in comparison that it brings about a feeling of shyness and a motivation to succeed. We can never achieve what he achieved, but we can sacrifice one bad desire or one bad characteristic. We can learn to place less importance on physical enjoyments and more importance on serving others. When we study the life of Prophet (s) and the lives of his family, it makes us realize how small we are in comparison and how far we are coming short. Every night in our meditation we should be crying and apologizing to Imam Hussain حسين (as) that, “Ya Imam Hussain حسين! You gave your life for the love of Sayyidina Muhammad (s) like all Ahlul Bayt and the Beloved Khulafae Rashideen wa Mahdiyeen, Sayyidina Abu Bakr as Saddiq, Hadrat Omar ar Faruq, Hadrat Uthman ibn Affan, Hadrat Imam ‘Ali, Imam Hassan wa Imam Hussain [as]. You sacrificed your entire being to stand up for the way of Prophet (s), and I am struggling just to leave one bad characteristic. How can I ask to sit at your table in Paradise when I have accomplished nothing good with this life. I am asking to dedicate my life to Sayyidina Muhammad (s), but I am struggling. Ya Imam Hussain حسين! 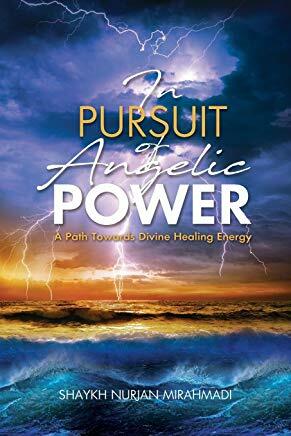 From what the Divine has given to you, support me! Give me the strength to overcome my bad desires. Grant me the energy to work for Prophet (s) and for Mawlana Shaykh, to spread his message of peace and spirituality. They are waiting to be of service, but first you must ask. When Adam was in paradise, the Lord ordered Gabriel to take Adam on a tour through the whole of paradise’s gardens. They toured the Jannah and Adam espied a great castle of Light whose walls were made of gold and silver, of topaz and ruby and most precious materials. Inside the castle was a throne of light underneath a dome of light. Upon the throne sat a person of amazingly beautiful aspect who made Adam forget all the beauty of Eve in an instant. There were also five gates to the palace of light and an inscription above each of these. 1. 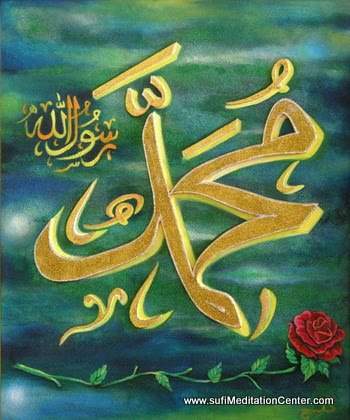 “I am the praiseworthy, and this is Muhammad محمد. 2. “Above the second : “I am the highest of the high and this is ‘Ali علي. 3. 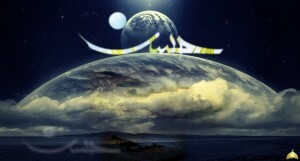 “Above the third: “I am the Creator, and this is Fatima فاطمة. 4. ” On the fourth: “I am the beneficent, and this is Hassan حسن. 5. ” And above the fifth gate: “I am the bestower of charity, and this is Hussain حسين. “Gabriel said to Adam: “Mark well these names, oh Adam, there will come a day when you will have need of them.” Now, when Adam descended upon the earth he wept for three–hundred years. Then he heard a voice, calling to him: “Adam, look upon the Baitul-Mamur” (up in the heavens.) Adam directed his gaze upwards, then he prostrated himself and said: “Oh Praiseworthy One, for the sake of Muhammad, oh Highest of the High, for the sake of Ali, oh Creator, for the sake of Fatima Zahra, oh Beneficent One, for the sake of Hasan, oh Bestower of Charity, for the sake of Hussain حسين, forgive me, oh my Lord, and accept my repentance. Ya Al Hamid bi Haqqi Muhammad [s], Ya Al-Ala bi Haqqi ‘Ali [as], Ya Al Khaliq bi Haqqi Fatima az Zahra [as], Ya Al Rahman bi Haqqi Imam Hassan [as], Ya al Raheem bi Haqqi Imam Hussain [as]. 38:56 “Lord of the heavens and earth, and of what between them is, the All-Mighty, the All forgiving. (Sad (The Letter Saad) 38:66). That One Group that is Safe Must be Muhammadiun, For Love of Sayedena Muhammad [s] sacrifice everything and Love everyone, never cursing creation. Sayedena Muhammad [s] was sent as a Mercy to all Creation.